This collection of print and video interviews on the web stretches back to 1995. Hard to believe a person could do as much as Joe does and still find the time to be interviewed about his remarkable past, his brilliant present and the exciting future that lies ahead. The criteria for inclusion on the list is that the article must have direct quotes from Joe. You'll be amazed that as often as he's interviewed, Joe always has something new & interesting to say. 52) December 7, 2012 Joe Bonamassa Amp Rundown: Live at the Paramount Theatre • Wildwood Guitars" www.youtube.com/watch?v=7btlwj8FrVg The audio isn't great, but Joe is talking about one of his favorite topics! 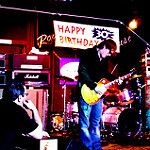 June 9, 2011 'High Voltage Q & A with Joe Bonamassa' www.youtube.com/watch?v=aZRN-J6EkWc& … embedded#! June 7, 2011 'Jack Bruce/Joe Bonamassa Review' www.guardian.co.uk/music/2011/jun/07/ja … ssa-review (breaking the rule here about interview quotes - none from Joe here, but those of us who know Jack Bruce know how big this review is! August 31, 2010 'Joe Bonamassa adds Dublin concert to October tour" http://hangout.altsounds.com/news/12145 … -tour.html Many photos of Joe in his very cool suit! 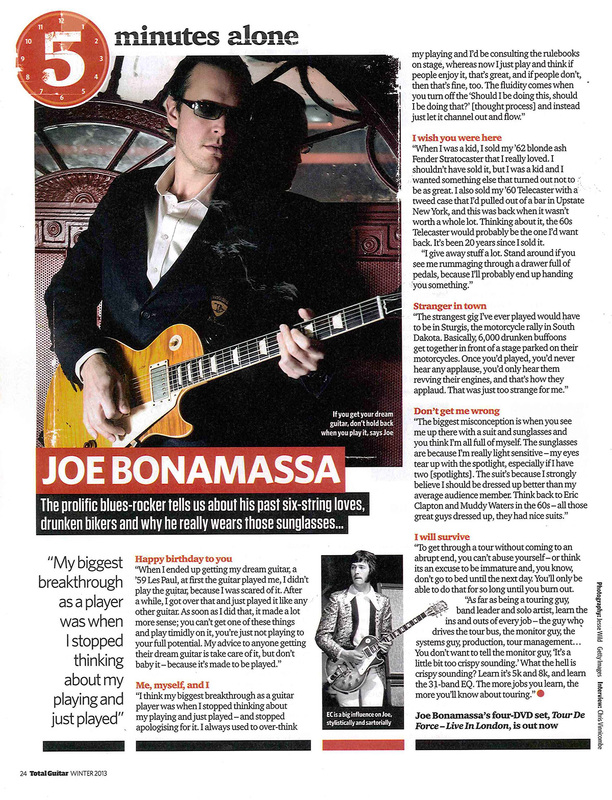 March 22, 2010 'Joe Bonamassa talks new album Black Rock: track-by-track' www.musicradar.com/news/guitars/joe-bon … 20#content An excellent interview, with GREAT photos! 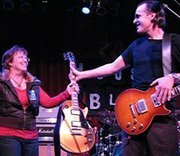 March 17, 2010 'Joe Bonamassa - Blues in the Schools' - these three videos count as 'Interviews' IMHO - Sacramento CA - Pattyluvsjoe found them! February 3, 2009 Yamaha Download Extras - Joe Bonamassa Bonus Audio Director's Cut of the Joe Bonamassa interview. March 2007 This interview appeared in Italian – the translation back to English is a little choppy but fun! This list is modestly maintained by Anne - Joe did all the work! Awesome bit of work, addy. It's fun to review those interviews and see just how open and forthcoming JB really has been over the last few years. A trip down memory lane. If you were here or I was there, I would buy you an ice cream cone with sprinkles on it!! Great job, thanks. This is helpful to fans and other journalists too! How about if we make it sticky. You know, we originally made this sticky. Guess the glue must've failed, since it wasn't that sticky anymore. Good stuff though. Thanks for the list ADDY. "Stars fall like tears from your eyes"
This is a long overdue BIG THUMBS UP for taking the time and effort to assemble this list, its TOTALLY AWESOME!! The MARYLAND BONAMASSALADIES ROCK BIG TIME!!! It's great to see so much ink be spread around about Joe. I was wondering if someone can help me remember where I read an interview & a question about his guitar collection...about his oldest guitar...I think Joe said it was a very old Martin that is more of a collector's item than something he plays currently. It may be from towards the end of 2007 and I know it was after the Vintage Guitar article and it wasn't in there. Thanks if anyone can help direct me toward that interview or if you know what Martin and year that was. If I shouldn't ask this here in a sticky, move me or delete me. "According to Joe, the real question is this: Do you touch people with your playing? To me, that's what it's about. If you can write an emotionally gripping song with a great solo, then you've hit a deadly combination. 'Wonderful Tonight,' 'The Thrill Is Gone,' and [Peter Frampton's] 'Do You Feel Like We Do' are songs that help people escape." Congratulations Joe on all the fine accolades of guitar greatness and the wonderful articles circulating about YOU, The New King of the Blues, Joe Bonamassa. Will see you in Santa Fe in three weeks! I came across this noteworthy interview titled "Young Gun, Old Guitars" by Walter Moseley, which originally appeared in Vintage Guitar magazine August 2007, and was just posted on the web 9/17/08. Check out the photos of some of Joe's beautiful guitars! PS: Joe says he "should have been born in 1950" because he's so into old guitars and old music - this will spark a sigh from some of us who wish that were true, because some of us would have been his adoring fans in the 70's - when he could have appreciated the babes some of us current fans used to be! babes us current fans USED to be??! !we are babes for ever!! we just now know what we're doing!! :) Addy thanks for the great list so a new fan like me can get caught up to speed! !